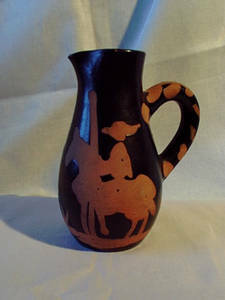 Description: I believe this is a Picasso Edition jug. At first I was skeptical, but after doing some research, I have a better feeling about this piece. I have found that Picasso frequented the local market place in the village where the pottery he was working at was (Madoura pottery in Vallauris in the South of France). He would purchase locally made utility wares to decorate. This wax relief was one of the methods used, and the bull fight subject matter is in line. Stylistally, it is right, and the red/black motif is also correct. It is now a confirmed Picasso Edition Pottery Jug. Thank you to all who have helped in identification and authentication.